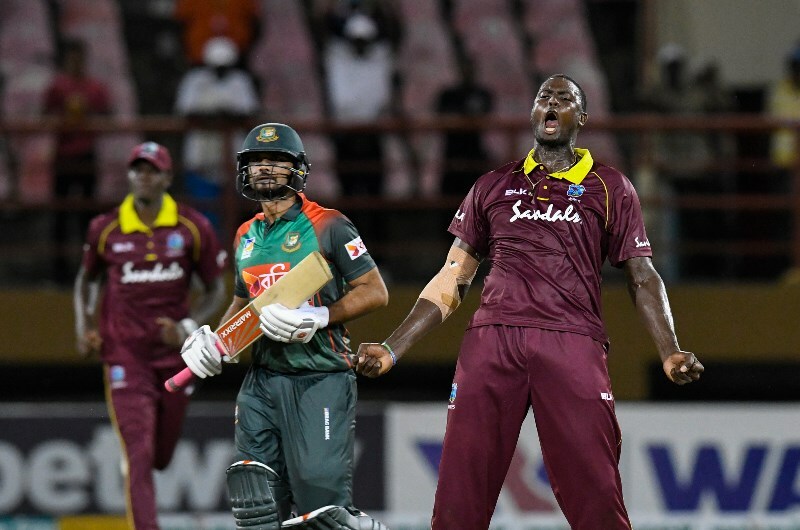 The defending champions West Indies defeated hosts Bangladesh by 50 runs in the third and deciding T20I played at the Sher-e Bangla Stadium, Dhaka on Saturday. It was an amazing performance by the West Indies, who posted 191 runs thanks to Evin Lewis's 89. In reply, West Indies bowlers bowled out Bangladesh and won the T20I series. Bangladesh captain Shakib Al Hasan won the toss and decided to field first. West Indies opener Evin Lewis took on the Bangladesh new ball bowlers, smashing them to all parts of the ground. Shai Hope looked good with some positive stroke play. The left handed Lewis reached his half century off just 18 balls. Hope and Lewis added 76 runs for the first wicket in just 5 overs, before which Shai Hope was dismissed for 23 off 13 balls. At the end of 6 overs, the West Indies had raced to 88 for 1. Lewis continued to smash the Bangladeshi bowlers with some clean hitting, before he was dismissed for 89 off 36 balls, with 6 fours and 8 sixes. The Bangladeshi bowlers made a comeback by picking regular wickets. Nicolas Pooran scored 29 off 24 balls. From 122 for 2, the West Indies were bowled out for 190 in 19.2 overs. For Bangladesh, captain Shakib Al Hasan, Mustafizur Rahman and Mahmudullah took 3 wickets each. Chasing the target of 191 runs to win, Tamim Iqbal was dismissed for 8 runs. Liton Das took on the West Indies bowlers as wickets fell at the other end. Das and Soumya Sarkar added 43 runs for the 2nd wicket, before Shakib, Rahim and Mahmudullah went cheaply. At end of 6 overs, Bangladesh were 70 for 4. Bangladesh kept losing wickets at regular intervals. Mehedi Hasan Miraz and Abu Haider added 33 runs for the 9th wicket, but the West Indies bowled out Bangladesh for 140 runs in 17 overs. Keemo Paul took 5 for 15, and Fabien Allen took 2 for 19. After losing the Test and ODI series, West Indies ended the tour on a high, winning the T20I series. West Indies 190 in 19.2 overs ( Evin Lewis 89, Nicolas Pooran 29, Mahmudullah 3/18, Mustafizur Rahman 3/33) beat Bangladesh 140 in 17 overs ( Liton Das 43, Abu Haider 22*, Keemo Paul 5/15, Fabien Allen 2/19) by 50 runs.